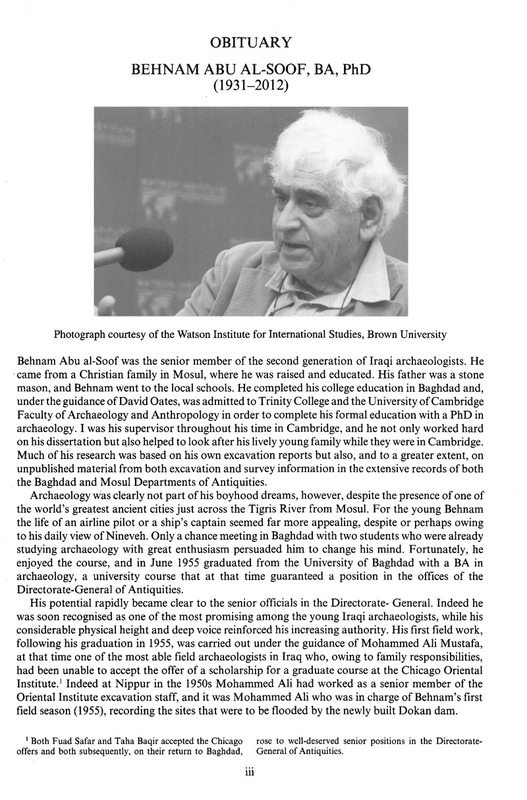 1 Both Fuad Safar and Taha Baqir accepted the Chicago offers and both subsequently, on their return to Baghdad, rose to well-deserved senior positions in the Directorate-General of Antiquities. 2 Very unfortunately, during the war the best of the Nimrud ivories had, for protection, been kept in a bank vault on Bank Street near the Tigris. This area was among the many heavily bombed, and the bank vault lay open both to the rain and to water from the Tigris. The greatest disaster, however, has been the post-war lack of reliable electricity for controlling the drying atmosphere essential to control the drying of the ivories. Regrettably, this has meant that the most splendid ivories, i.e those ‘protected’ by the bank vault, have become impossible to restore, despite the great efforts to protect them. 3 The one well that Mallowan realised was so dangerous that even he could not attempt to excavate it (in the AJ courtyard of the Northwest Palace), was very capably excavated by an Iraqi team. Unfortunately many of the extraordinary ivories found here have also not survived the recent war.